Welcome to Villa Azure, the newest listing in my Platinum Plus villa listing. 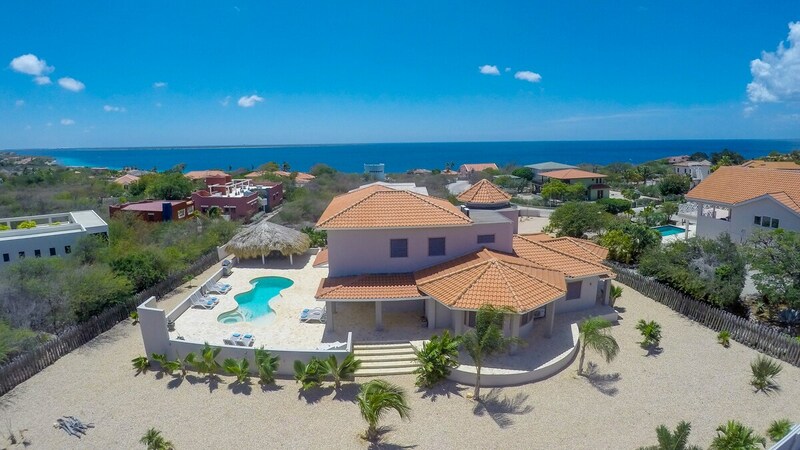 Villa Azure was built with a dream to provide a high-end luxury villa experience in true, casual Bonaire style. The villa can accommodate up to 12 people. The location affords stunning views of the Caribbean Sea. Trade winds cool the public areas but AC is available in the bedrooms, for sleeping comfort. The villa features a mature tropical garden with lush flowers and trees. There is a non-chlorinated pool with Jacuzzi, sunning deck, shady palapa’s and lovely loungers. Divers will appreciate the rinse tanks and storage. The main floor features a living and dining area with amazing wood furnishings. There is a gourmet kitchen for meal preparation. Prefer someone to create meals for you? Our services include private chef services. There are 4 bedrooms on the main floor with en suite bathrooms. There is a laundry room and ice machine. There is also a air conditioned gym on the lower floor. On the second floor, two bedrooms share a bathroom, private living space with TV and lounge as well as a and opening up to the sea. Rates include WiFi, pick-up service from Flamingo International airport to the villa, cleaning once a week and final cleaning, cleaning of swimming pool once a week, property manager at your service during your stay in the villa. Ask about off season specials. Wellness services are available at your home including massage, pedicure and manicure, Reiki, yoga and meditation. Come be pampered and nurtured. To book Villa Azure, contact ann@bonairecaribbean.com or call 001 508 737 5245.